My apologies in advance for the possible vagueness of this post. I read this book over a month ago – not usually a problem – but add to that a return to work, Christmas-mush brain and general over-tiredness as the year draws to a close, and you get this Blogger not quite remembering details of the book I read and about to review. Sorry! I do know that I did enjoy it and as crime/detective novels go, I found it quite an original one. 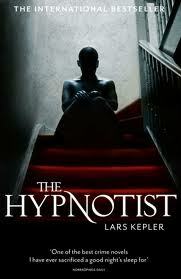 The Hypnotist is written by one of a number of Swedish crime authors coming out of the woodwork since the Millennium Trilogy. Of all the ones I have read, none of them match up to Stieg Larsson, in my opinion, but these Swedish crime authors seem to know their stuff and how to write compelling, original crime fiction. The story begins when we first meet Josef, a young traumatised boy – suffering from numerous cuts and stab wounds – as he relives the horror of home where his family has just been brutally murdered. He tells hypnotist, Erik Bark, of the graphically violent murder of his family. Through hypnosis, they (Erik and the Detective assigned to the case) find that Erik has potentially witnessed the whole gruesome affair and therefore becomes their Key Witness. As further hypnosis sessions happen, they learn of a missing sister who the police are baffled as to her whereabouts but they realise that she is in grave danger. However, Erik starts to question the feasibility of Josef as a witness and isn’t entirely convinced that he is reacting as he should when under hypnosis. This then leads to the reader questioning everything you ‘learn’ throughout the hypnosis sessions, and also causes you to doubt Erik, Josef, the Detective and the whole policeforce working on the case! Where is Josef’s sister? Is her life in danger too? Why were the family selected to be slaughtered? What exactly did Josef witness?? I love a book that raises more questions than it answers early on in the book. ‘ The Hypnotist’ keeps you guessing and once you know what is really going on – relatively early in the story – the ensuing confusion and mayhem certainly holds your interest. I’m not sure if Lars Kepler has written other crime novels but I will be reading them if he has.